Emoke B'Racz (l.), Linda-Marie Barrett (c.) and Alsace Walentine. Alsace Walentine, longtime author event coordinator at Malaprop's Bookstore/Café, Asheville, N.C., will open a bookstore in St. Petersburg, Fla., in the fall of 2016. She will draw on 16 years of experience in bookstore management and event coordination, as well as what she calls "priceless mentorship" from Emoke B'Racz and Linda-Marie Barrett, Malaprop's owner and manager. Walentine will join her wife, Candice, in St. Petersburg and is excited to be opening a business in a city with a thriving Keep Local movement. Inspired by Malaprop's, the yet-unnamed bookstore will offer new books of all genres, author and community events and, of course, delicious locally brewed coffee. Barrett called Walentine "one of the finest booksellers I know, and a beloved coworker and friend." Walentine can be reached at alsacedior@gmail.com. A quarter of men who read at least one book a month have positive opinions about book clubs but are unwilling to join one, and many book club choices defy the stereotype of "women's fiction." In addition, more and more clubs are reading books close to publication date, which has implications for publishers. These and other findings are in a 20-page white paper called "Book Clubs in the USA," released today by BookBrowse, the online magazine for book lovers and book clubs. The paper, based on results from a 3,600-person survey conducted last April and years of in-depth interviews, reveals some surprising statistics about the world of book clubs. Those surveyed were all United States residents who read at least one book a month, whether they belonged to a book club or not. One non-surprise: book club membership skews toward older, more educated female readers, with spikes in participation rates during empty nesting and retirement ages. Despite the positive interest of some men, many of them are put off by what they perceived as standard book club selections, described by one respondent as "interpersonal dynamics literary fiction." When asked about their ideal book club, most men stressed variety in selected book genres and a balanced gender mix. One man who had been in a book club said, "I was always asked what my take was at certain points of the book. My answers left some of the women open-mouthed; they said they never thought of that." Still, book club selections are made to member tastes, and few genres are off limits, despite stereotypes about focusing only on "women's fiction." Historical fiction is more popular than fantasy because the former has more fans and potential for meaningful discussion. 80% of book clubs occasionally read local authors and enjoy author visits, though some members are uncomfortable discussing books in front of the authors who wrote them. Four out of 10 book clubs select their books more than four months in advance, a potential problem for publishers. Though reading guides are only a factor in a third of book club choices, publishers might consider putting them in the first run of hardcovers since fewer book clubs are waiting for paperbacks. With half of book club members reporting that they read in e-book format always or frequently, clubs are discussing books closer to their publication dates than in past years. As the paper says, "there is a case for publishers to position to book clubs as early in the book's life cycle as is practical." Online book clubs are growing alongside e-reader ownership. Some 22% of those polled belonged to at least one online book club, though the exact definition of such a club is amorphous (some respondents asked if Goodreads counts). Online book clubs tend to be larger than in-person book clubs, with 60% having more than 40 members. 60% of in-person clubs have 10 or fewer members. 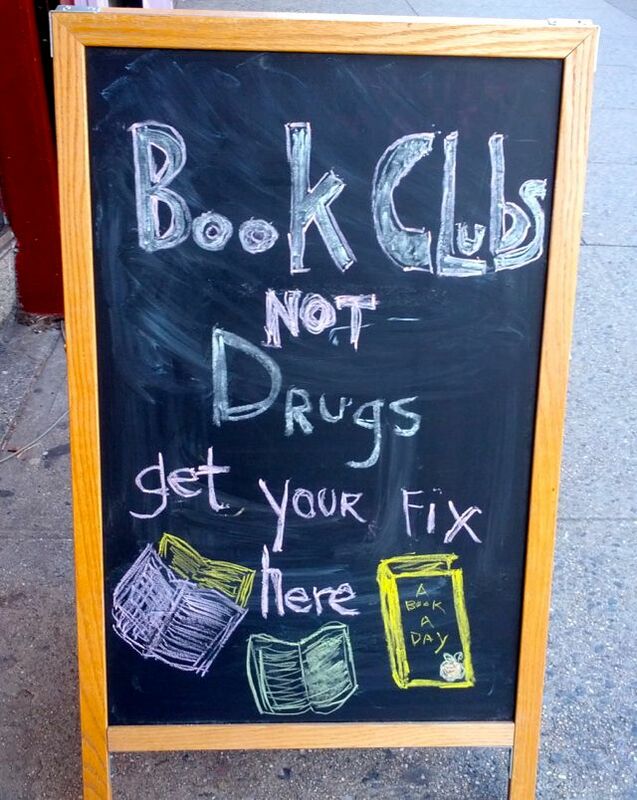 A third of all book club members belong to multiple clubs. The full white paper is available on BookBrowse. "Understanding how book clubs operate is important to publishers, librarians and booksellers," said Davina Morgan-Witts, BookBrowse founder and chief editor. "But this white paper is not only for them. There is lots of useful information and advice for authors looking to reach book clubs and, of course, for book club members interested in finding out how other groups run." True-crime author Ann Rule, who wrote 35 books, "including a profile of her former co-worker, serial killer Ted Bundy," died Sunday, the Associated Press reported. She was 83. In addition to The Stranger Beside Me, Rule's books included Small Sacrifices: A True Story of Passion and Murder and Too Late to Say Goodbye: A True Story of Murder and Betrayal. Her latest book, Practice to Deceive, was about a murder on Whidbey Island in Washington State. Her books have 50 million copies in print in 16 languages. Noting that the FBI and the Justice Department eventually "started turning to Rule for her expertise on serial murders," the AP wrote that "she aided the Green River Task Force as that group sought another Seattle-area serial killer, passing along tips that her readers shared. She wrote a book about the case, Green River, Running Red." The Los Angeles Times noted that Rule "was truly the 'Queen of True Crime,' humanizing the victims as she told their tales." "By deciding to focus her books on the victim, Ann Rule reinvented the true-crime genre, and earned the trust of millions of readers who wanted a new and empathetic perspective on the tragic stories at the heart of her works," Carolyn Reidy, president and CEO of Simon & Schuster, commented. "She will be remembered not only for her many books, but also for her ongoing and tireless work on behalf of victims' rights. We are proud to have been her publisher for many years, and we will miss her." Artist and Archie cartoonist illustrator Tom Moore, who "brought to life the adventures of the beloved red-haired, freckled-faced Archie Andrews and his friends on and off from 1953 until his retirement in the late 1980s," died June 20, the El Paso Times reported. He was 86. "He's a legend, in El Paso and, really, around the United States," said All Star Comics & Games owner Brad Wilson. "A lot of people don't realize how much he influenced comic book art.... He was still buying comics and a really nice guy, a fun guy." Nebraska Book Company is changing its trading name to Nebraska Book Holdings, Inc., from Neebo, Inc., a move that has been approved by the Financial Industry Regulatory Authority. In June, the company sold its retail division, which included more than 200 campus bookstores and the Neebo brand name, to Follett, and changed its corporate name to Nebraska Book Holdings. Nebraska Book Company has a wholesale division that rents and sells more than seven million textbooks a year and installs and supports tech platforms and e-commerce sites at more than 1,200 stores. 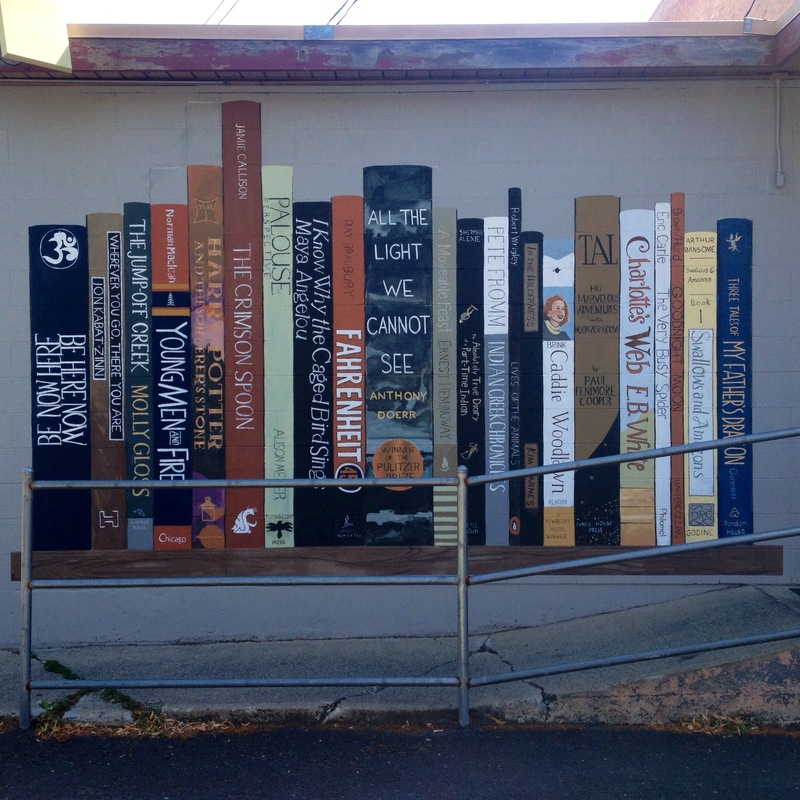 BookPeople of Moscow, Idaho, has a new mural on the back of the store, which faces the public parking lot on Moscow's Jackson Street. Co-owner Carol Spurling said, "The book selections are some local favorites, some personal favorites, some classics, and a few just for fun. The artist is Chris Pavlik. We think he did a lovely job." We agree! 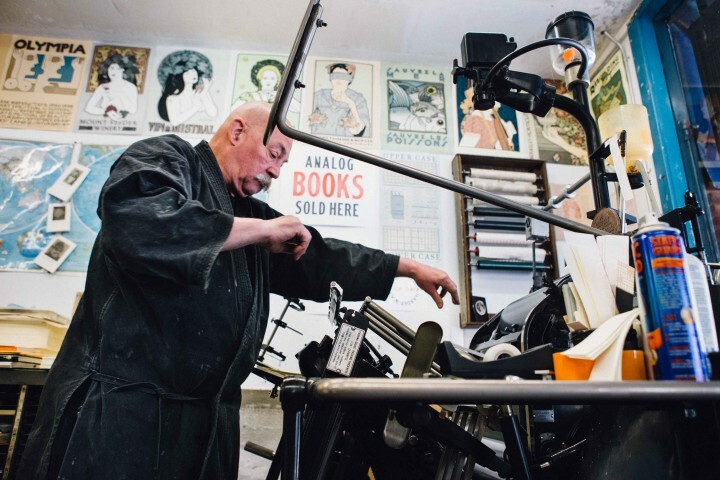 As part of its series on expert craftspeople in Berkeley, legendary letterpress printer and lithographer David Goines and his St. Hieronymus Press were profiled by Berkeleyside, which noted: "Several pieces that have awarded him widespread attention include a collaborative book with Alice Waters, the owner of Chez Panisse, called 30 Recipes Suitable for Framing, and posters for well-known Bay Area spots, like Acme Bread and UC Berkeley." Waters "frequented the shop to have pamphlets printed for a political campaign she was involved with, and the two artistic minds became quick friends. 'I would invite her up for coffee and cognac and one thing led to another.' After their collaborative book was an immense success, Goines and Waters used this seed money to establish both their businesses in 1971--Saint Hieronymus Press and Chez Panisse," Berkeleyside wrote. When falling asleep, when waking up, and at times in between. 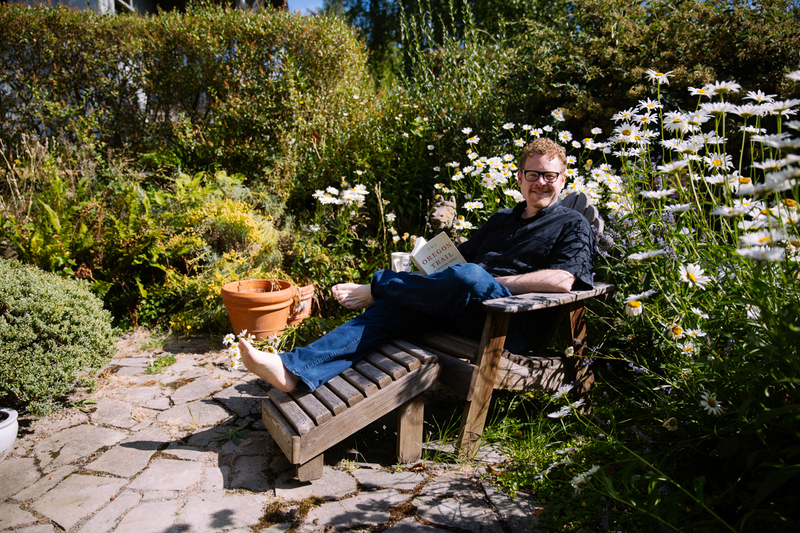 Where do you read at home? We have a few prime spots, including a chaise lounge in our secluded study that gets good natural light in the afternoon, and a great bathtub for reading on cold dark nights, though truly a cool bath and a book have begun to look tempting this hot summer. (I'd be remiss if I didn't add: no library books in the bath, please!) Mostly in bed: that's where the bulk of our reading happens, both silently and aloud. Let's talk organization. How do you keep track of your books? Ha! Badly. Most librarians are very well organized, and take a special joy in keeping everything its place. I'm the other kind of librarian, and my home shelving system is pretty whimsical and frankly disorganized. In my basement library, books are two-deep on the shelves and mostly wedged in any which way in a subjective hodgepodge. Some titles are grouped on a theme, while others are arranged by chance, by size and even by color. Public libraries have to have an internally consistent organization, but personal libraries can follow whatever suits their creator's fancy, and I feel at home in a somewhat chaotic forest of books. I like those kinds of bookstores too--great tumbledown used bookstores that send you digging through piles in search of hidden treasure. I do keep my library books in one or two spots, in an effort to reduce the amount of fines I pay each month, and would recommend the same strategy to others. In his latest Free Speech column at Bookselling This Week, Chris Finan, director of the American Booksellers for Free Expression, posed the question: "Is it time to retire Banned Books Week?" Not surprisingly, the answer was an emphatic no. Noting that while "the number of reported challenges has fallen," Finan wrote that "statistics do not give a full picture of what is going on. The reality is that censorship is still a problem in this country, and most of the victims are kids. Sometimes books are literally taken out of their hands.... Whatever the actual number of challenges, we can be sure that there would be many more if there weren't people all over the country resisting efforts to ban books. 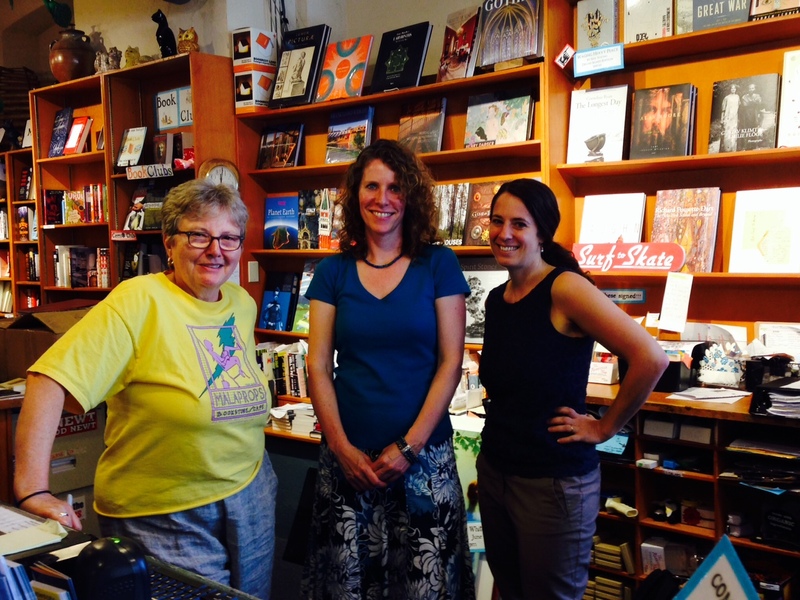 Booksellers have joined teachers, librarians, parents, students, and other concerned citizens in fighting back." While most bookstores may never have an opportunity to take a prominent role in a censorship fight, "all booksellers can help carry the message," Finan observed. Today on Fresh Air: Anil Ananthaswamy, author of The Man Who Wasn't There: Investigations into the Strange New Science of the Self (Dutton, $26.95, 9780525954194). Tomorrow on Diane Rehm: readers review Orphan Train by Christina Baker Kline (Morrow, $14.99, 9780061950728). Tomorrow night on the Daily Show: Doris Kearns Goodwin, author, most recently, of The Bully Pulpit: Theodore Roosevelt, William Howard Taft, and the Golden Age of Journalism (Simon & Schuster, $22, 9781416547877). Tomorrow night on the Tonight Show: Jason Segel, co-author of Nightmares! (Yearling, $7.99, 9780385744263). The first trailer has been released for The Maze Runner: The Scorch Trials, a sequel based on the book series by James Dashner, starring Dylan O'Brien and directed by Wes Ball, Indiewire reported. The ensemble cast includes Kaya Scodelario, Thomas Brodie-Sangster, Rosa Salazar, Jacob Lofland, Giancarlo Esposito, Aidan Gillen, Barry Pepper and Lili Taylor. The movie opens September 18. Today, Helen "Joy" Davidman is known primarily as the wife of C.S. Lewis. But before she became the cherished companion of one of the 20th century's leading theologians and writers, she had worked hard to build her own writing career. 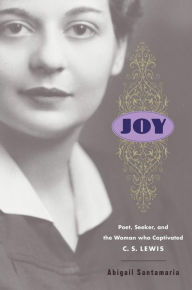 A poet, critic, onetime ardent Communist and lifelong spiritual seeker, Joy was a brilliant but difficult woman. Abigail Santamaria explores the many facets of Joy's life and career in her new biography, titled simply Joy. The daughter of educated, upwardly mobile Jews, Joy grew up in the Bronx and Brooklyn. She earned a degree from Hunter College and spent several years teaching high school, but she hated the work and was determined to pursue her lifelong dream of being a writer. Santamaria delves into Joy's early writing career, sharing excerpts from her passionate poems and the essays that appeared in New Masses and other publications produced by the Communist Party. Intellectually curious yet hungry for a cause she could believe in, Joy believed in the Communist Party, and her association with the Party helped her career to flourish for a time, as did several summers she spent writing at the MacDowell Colony in New Hampshire. But by the time of her first marriage, to fellow writer Bill Gresham, Joy was becoming disillusioned with the Party. She also had several experiences of what she called "moments of grace," which set her on a journey toward the Christianity she would later embrace. While she clearly admires her subject, Santamaria acknowledges Joy's failings: her tendency to exaggeration and even lying; the spending sprees she could rarely afford; her troubled relationship with her parents and brother. Joy's marriage to Bill also receives an even-handed treatment. Bill was undoubtedly an alcoholic who struggled to maintain a stable family life, but Santamaria clearly outlines the part Joy played in the failure of their marriage. Frustrated by professional and personal setbacks, Joy uprooted her life--and that of her two young sons--to travel to England in 1952. She had struck up a flourishing correspondence with Lewis, and she set out to woo her literary lion. Santamaria chronicles the difficulties of Joy's life in England and Lewis's reaction to her arrival, but admits that, in the end, they did fall deeply in love. As Joy's health began to fail, her relationship with Lewis flourished, and their last few years together were blissful. Shelf Talker: An insightful biography of Joy Davidman reveals new facets of the brilliant, complicated woman who married C.S. Lewis.